18 April 2017-DENVER — Experiments conducted high in the skies over New Mexico suggest that balloon-borne sensors could be useful in detecting the infrasound signals generated by small, extraterrestrial debris entering Earth’s atmosphere, according to a report at the 2017 SSA Annual Meeting. Infrasound, sometimes called low-frequency sound, is sound waves that occur at frequencies lower than the limit of human hearing. Infrasound signals can remain strong as they travel over large distances, making them useful for pinpointing the location and size of events such as nuclear explosions, meteorite strikes, volcanic eruptions and sometimes earthquake ruptures. Ground sensors can detect these signals, but very small infrasound signals can be swamped out by wind and other ambient noises gathered by these devices. So researchers including Eliot Young of the Southwest Research Institute and Daniel Bowman of Sandia National Laboratories are looking for quieter places to position these sensors — in this case tethering them to high-altitude balloons. 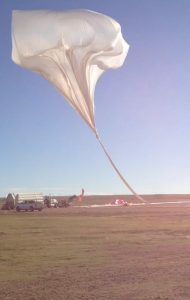 To test the sensitivity of balloon-borne detectors, Young and his colleagues arranged three large ground explosions (equivalent to about 2400 pounds of TNT) to occur while they flew infrasound sensors on a balloon flying at an altitude of 35 kilometers, or nearly 22 miles in the air. The flying sensors were able to detect all three explosions at that height, and at a lateral distance away from the explosions of about 350 to 400 kilometers, or between 220 and 250 miles away (Download a movie of the balloon launch here). Bowman also flew a smaller solar balloon at a lower altitude — about 15 kilometers — during the experiment. The solar balloon was able to detect one of the explosions, and the researchers noted that the amplitude of the infrasound signal was about five times stronger than that detected by the high-altitude balloon. “It looks like you gain the advantage of no ambient wind noise with a lower balloon, but you don’t have the disadvantage of being so high up that the pressure has really dropped and your signals are small,” Young said.